Life cycle: Three to four generations per year. 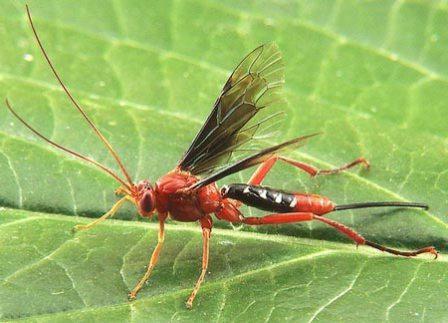 Physical Description: Most Ichneumons can be distinguished by the long, thin Ovipositor projecting from the end of the abdomen of the females. The antennae are long and thread-like. The wings are transparent with a dark spot (in most species) at the front margin of the first pair of wings. In some species, the abdomen has a pronounced arched. Feeding characteristics: The Ichneumon is parasitic. The females deposit their eggs in the body of Caterpillars (Lepidoptera). Other species are parasites of Hymenoptera and Coleoptera. The tiny larvae that hatch fed upon the fatty tissues of the Caterpillar's body without damaging any vital organs. When the Ichneumon larvae are almost full-grown they begin to feed on the more vital organs, resulting in death of the caterpillar. In many cases the Caterpillar continues to live, and it is only after the Ichneumon larvae enters the pupa stage and attacks the vital organs, does the Caterpillar die. What is even more astounding is the Ichneumon larvae may enter the pupa stage within the pupa of the Butterfly or moth. Eventually the adult Ichneumon eats its way through the skin of the Caterpillar.